Yup, its that time again... time to catch up on July's CSA deliveries from Limestone Farms! This week's delivery continues our hot weather veggie theme! Summer has definitely arrived in South Carolina - with temps in the triple digits nearly every day! 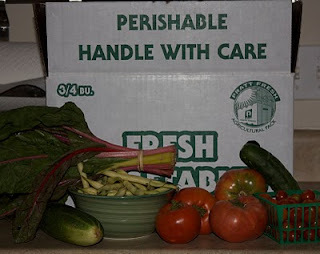 Swiss Chard, Wax beans, cucumbers, tomatoes! And, during the week we even picked up an additional 10# of tomatoes! Homemade tomato sauce here we come! And oh yea, PS.... I didn't forget Week #8! I was lucky enough to surprise hubby with a trip to Disney World for our anniversary!